Trusted and timely answers using innovative technology implemented by leading experts in utility detection and mapping. GEL Solutions is proud of our track record in providing solutions to challenging Subsurface Utility Engineering (SUE) projects. The SUE process, developed by the Federal Highway Administration (FHWA), prevents unnecessary interruption of services due to unexpected encounters with buried utilities and infrastructure. Utility location information is critical in design and construction of any project because costly relocation of buried infrastructure is avoided. Design engineers can incorporate the locations of existing utilities into their development plans, thereby preempting the expensive and unnecessary relocation of buried infrastructure. In fact, the most recent FHWA study shows that for every $1 spent on SUE, a project cost savings of $4.62 is realized. GEL Solutions provides the most accurate, complete, and cost effective SUE information through the use of innovative technologies. 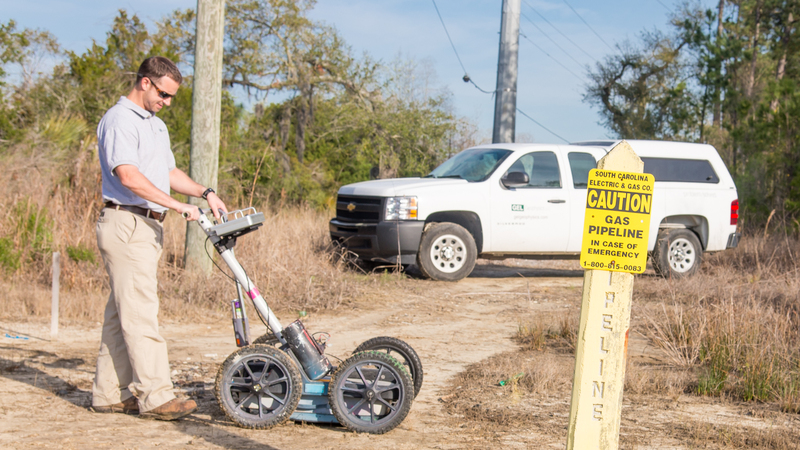 Our SUE services utilize standard utility designating tools such as ground penetrating radar (GPR), radio-frequency electromagnetic (EM) methods, and vacuum excavation. However, our geophysics background allows other tools such as the 3D Radar Tomography (RT), time-domain EM, and magnetics to be used when needed on difficult SUE jobs. QL-D: Research of utility databases, interviews, and collection of as-built information from utility owners. QL-C: Survey and visual inventory of above-ground features associated with utilities in order to assess the general accuracy and completeness of the information obtained in QL-D.
QL-B: Designation of the approximate horizontal location of subsurface utilities using geophysical methods (GPR, CART and other specialized geophysical equipment). Deliverables for QL-B include surveyed drawings of all utility features with attributes showing the quality information of each utility line, and includes QL-D and QL-C data as appropriate. QL-A: Use of vacuum excavation equipment to safely dig test holes and expose utilities. This provides an exact 3D location and positive identification of the utility.